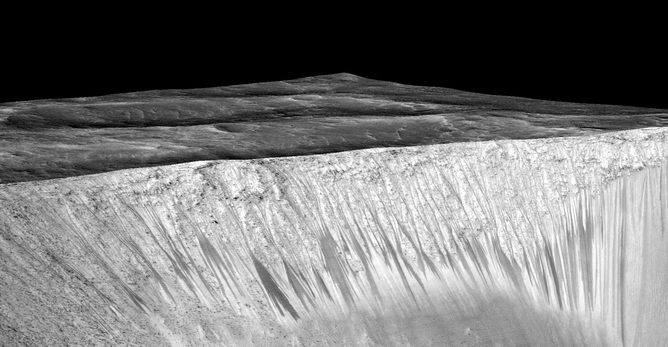 Salty streaks have been discovered on Mars, which could be a sign that salt water seeps to the surface in the summers. Scientists have previously observed dark streaks (see image above) on the planet’s slopes which are thought to have resulted from seeps of water wetting surface dust. Evidence of salts left behind in these streaks as the water dried up are the best evidence for this yet. The discovery is important – not least as it raises the tantalising prospect of a viable habitat for microbial life on Mars. I have lost track of how many times water has been “discovered” on Mars. In this case, the researchers have detected hydrated salts rather than salty water itself. But the results, published in Nature Geoscience, are an important step to finding actual, liquid water. So how close are we? Let’s take a look at what we know so far and where the new findings fit in. 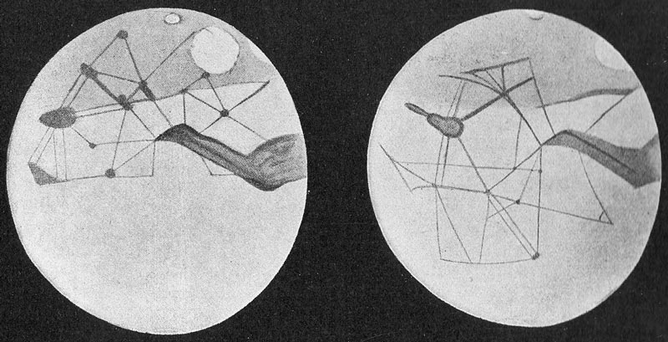 Back in the 18th century, William Herschel suggested that Mars’s polar caps, which even a small telescope can detect, were made of ice or snow – but he had no proof. It wasn’t until the 1950s that data from telescopes fitted with spectrometers, which analyse reflected sunlight, was interpreted as showing frozen water (water-ice). However, the first spacecraft to Mars found this difficult to confirm, as water-ice is in most places usually covered by ice made up of carbon dioxide. 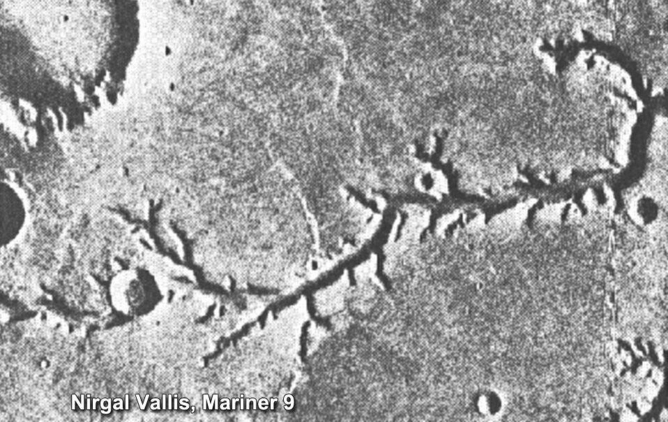 In the 1970s attention turned to the much juicier topic of liquid water on Mars, with the discovery by Mariner 9 of ancient river channels that must have been carved by flowing water. These channel systems were evidently very ancient (billions of years old), so although they showed an abundance of liquid water in the past they had no bearing on the occurrence of water at the present time. Things became more interesting in 2000, with the announcement that high-resolution images from the Mars Orbiter Camera on board Mars Global Surveyor showed gullies several metres deep and hundreds of metres long running down the internal slopes of craters. It was suggested that they were carved by water that had escaped from underground storage. Such small and sharp features had to be young. They could still have been thousands of years old but annual changes were soon noticed in a few gullies which appeared to suggest that they were still active today. Are gullies really evidence of flowing water? Some probably are, but there are other explanations such as dry rock avalanches or slabs of frozen carbon dioxide scooting downhill. Some gullies start near the tops of sand dunes where an underground reservoir of water is very improbable. In 2008 the lander Phoenix actually saw water on Mars. 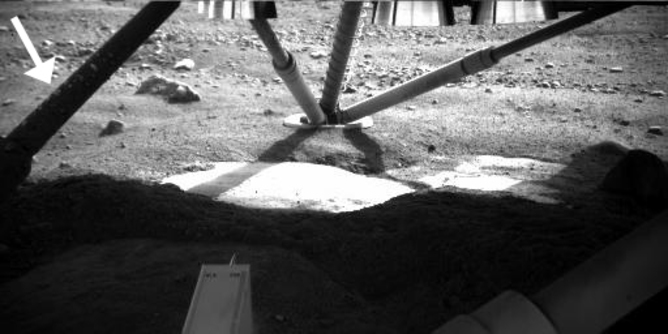 When it scraped away at the dirt, it found water-ice a few centimetres down, but more excitingly droplets that could hardly be anything other than water were seen to form on the lander’s legs. It was suggested that the water had condensed around wind-blown grains of calcium perchlorate, a salt mineral whose properties enable it to scavenge water from the air and then dissolve it. Moreover, whereas pure water would freeze at the local temperature at the time (between -10°C and -80°C), water containing enough dissolved salts could stay liquid. In 2011 a new phenomenon was recognised on high resolution images from orbit by the Mars Reconnaissance Orbiter. These are “recurrent slope lineae” or RSLs, dark downhill streaks that come and go with the seasons (which last about twice as long as seasons on Earth). They are usually between 0.5m to 5m wide, and not much more than 100m long. These could mark avalanches of dry dust, but the favoured explanation has always been – and which the new NASA find also suggests – is that water is seeping from the ground and wetting the surface enough to darken it, though without flowing in sufficient volume to erode a gully. What is most noteworthy about the new research is that it is the first determination of the composition of the streaks. They used an instrument called CRISM (Compact Reconnaissance Imaging Spectrometer for Mars) on board the orbiter to analyse the light reflected off the surface of these streaks. In this way, they could show that they contain salts that are most likely to be magnesium perchlorate, magnesium chlorate and sodium perchlorate. These kinds of salts have antifreeze properties that would keep water flowing in the cold temperature, and tallies with what Phoenix had suggested in 2008. There are no signs that liquid water was present when the NASA measurements were made. Scientists will surely keep looking in the same spot in the hope of finding the features that would indicate liquid water instead of those indicative of salts left behind after the water has dried up. However, few can doubt that the salts were put there by flowing water. Importantly, with liquid water comes the prospect of life on Mars. The researchers cannily conclude by pointing out that in the most arid parts of Earth’s Atacama desert the only source of water for microbes is what they can get from salts dissolved in water. If it can happen on Earth, maybe it can happen on Mars too.